Hope your Thursday is a good one so far. Here is my third project of three that I made with the Jubilee Paper Pack and Jubilee Chipboard Complements. For this layout, I used the remaining pieces of paper left from the paper pack. I did also include some regular white cardstock and some kraft cardstock. 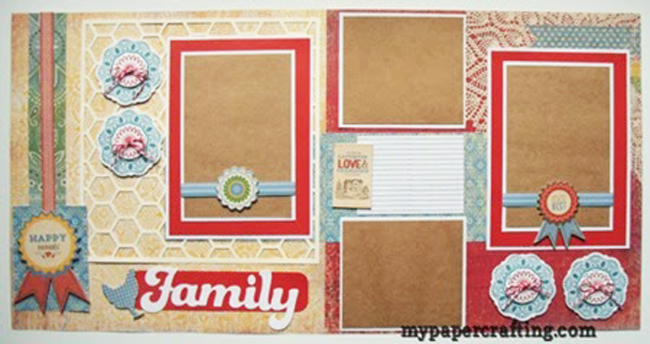 I also included a piece of buttercup from the basic cardstock set for the honeycomb overlay. Sadly, the Jubilee paper pack as well as the matching chipboard complements will be retiring at the end of the month. So don’t miss your chance to snag it while it is still available. Here’s a closer look at the nice chipboard element. I used one of the “zip strips” and wrapped it around my photo mat. I then used a glue dot to adhere the element to the zip strip so that a photo will slide easily underneath and yet allow the chipboard element to be secure. Here’s a look at one of the other chipboard elements. I used some foam tape to give it just the slightest lift off the page for a little extra dimension. Note: the red and white gingham strip at the top is also a chipboard element. It isn't a piece of ribbon although it certainly looks like it. 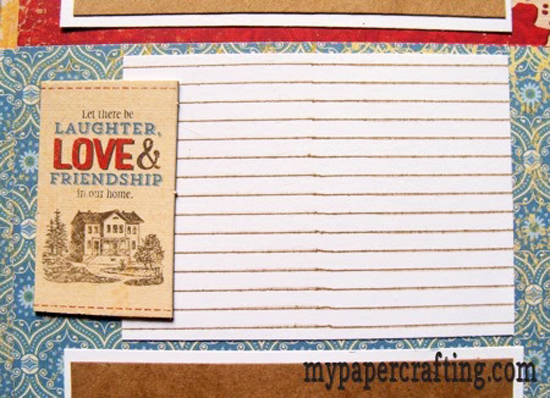 For the lined journaling note card, I simply used the lined note stamp included in the Cricut Artbooking bundle. 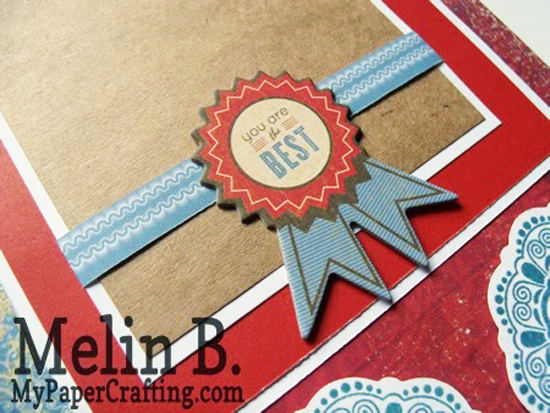 I stamped it with my Saddle Ink Pad and then trimmed it down so that it looked like simple lines. The chipboard element came as a tag element. I chose to trim it down so that it looked like a sentiment only. Here’s a closer look at the Family title. The red strip underneath was again a piece of left over paper. I used some white cardstock and my Artbooking cartridge to cut out the letters. I cut them out at 1.75”. The cute Chicken element is also one of the chipboard elements in the set. Note: The Twilight Ink Pad, Harvest Assortment Twine are both retiring products. You have done some amazing projects/LOs with the paper collection that least attracted me. It made me wish I had gotten that paper pack...I especially like the LO posted today...beautiful...those button embellishments are awesome!